Born in Wordsley, live in Birmingham (UK). 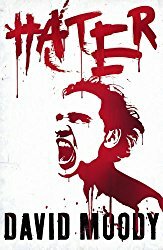 This might be cheating, but I’ve copied and pasted my current bio: A pioneer of independent publishing, DAVID MOODY first released HATER in 2006, and without an agent, succeeded in selling the film rights for the novel to Mark Johnson (producer, Breaking Bad) and Guillermo Del Toro (director, The Shape of Water, Pan’s Labyrinth). Moody’s seminal zombie novel AUTUMN was made into an (admittedly terrible) movie starring Dexter Fletcher and David Carradine. He has a unhealthy fascination with the end of the world and likes to write books about ordinary folks going through absolute hell. 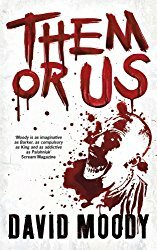 With the publication of a new series of Hater stories, Moody is poised to further his reputation as a writer of suspense-laced SF/horror, and “farther out” genre books of all description. 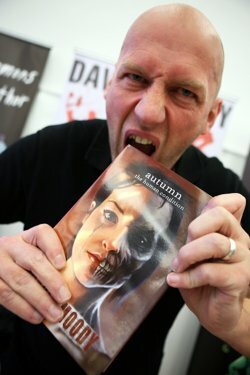 Find out more about his work at http://www.davidmoody.net and http://www.infectedbooks.co.uk. I recently released the first book in a new HATER trilogy called ONE OF US WILL BE DEAD BY MORNING. The sequel, ALL ROADS END HERE, is out in September from St Martin’s Press in the US. I’ve also just released YEAR OF THE ZOMBIE through my own imprint Infected Books. YOZ is a massive anthology featuring 11 superb writers (and me!). It’s a huge 180k words of zombie goodness. When I left school I wanted to make films. Back then neither the technology nor the training were available to be able to make serious indie movies, so I was left high and dry with a head full of story ideas. I’d always had a flair for English at school, so started to write. When I finished my first novel. The ending and a song! I had a great idea for a final scene (inspired by Straight to You by Nick Cave and the Bad Seeds) and I just worked my way back to the beginning. After a number of failed attempts to write, I approached the novel like a work project – I wrote at least a page a day every day, and I didn’t allow myself to go back and start editing until each draft was complete. I do – no frills. I’ll vary the perspective and the voice, but I feel like I generally just write what I see (in my head). There’s very little literary about my books! I think that’s a holdover from wanting to make films. I don’t tend to start a project until I can ‘see’ the whole thing in my head. Titles are funny things. Sometimes I have the title first, sometimes it’s the very last thing. All the way through the planning and writing of my next book, it was called THE OTHER HALF. I thought that was really smart and clever – it’s a ‘side-quel’ to my HATER series telling the same events from another perspective (ie the other half), and it’s about a man trying to get home to his partner (again, his other half). And where it’s set, there’s a clear distinction between different sections of society (how the other half lives). All smart and good, but my editor and I realised it wasn’t a title that was going to sell books. So, after it had been written, it became ALL ROADS END HERE. Not a message as such, more an observation: people can be bloody horrible to each other, and the higher the stakes, the more pain and damage they’ll inflict on others to save their own skin. The Hater books aren’t the most cheery books you’ll find! Now that’s a really interesting question. Some aspects of my books are incredibly far-fetched (eg half of the population turning into crazed murderers), and yet I try to make all my books feel believable. The characters are key to doing this. I write about really ordinary people who find themselves in really extraordinary situations, and I find that helps readers to really buy into the books. Experiences – no. Characters – definitely, yes! I always describe myself as a ‘people watcher’. I can’t help being influenced by the people I come across. In fact, I gave up being a full-time writer for that exact reason. When I was at home on my own all day, every day, the inspiration dried up. The moment I went back into an office environment, though, surrounded by other people and their quirks and issues and problems and traits, the stories began to flow again. I joke that if folks annoy me at work, I’ll put them in a book and give them a really horrific death (I used to do that many years ago when I had a particularly difficult job looking after a particularly large and difficult team! When I got wound up by someone at work, I’d turn them into a zombie and give them a particularly gruesome death scene in my current book! Fiona: What books have most influenced your life most?a mentor? Day of the Triffids by John Wyndham. A ground-breaking novel which, considering it was about carnivorous 8 feet tall plants that can walk, feels frighteningly plausible! I don’t believe I’ve ever had a mentor as such, but I always admired James Herbert. An unreleased book called The Chrysalis, by an editor I’ve worked with previously, Brendan Deneen. It’s an excellent read, and deserves to find a wide audience when it’s published later this year. Sadly I haven’t had time for a while to check out new authors’ works. It’s interesting just how many new authors there are these days! Independent publishing really opened the floodgates. Here, though, I should definitely give a plug to YEAR OF THE ZOMBIE which I mentioned earlier. I was fortunate enough to be able to bring some well known authors on-board, but I was keen to hear from some newer voices too. Three of the authors involved in the project were previously unpublished, and every one of the stories in the collection are hugely enjoyable. Right now I’m writing CHOKEHOLD, the very last book in the HATER series. I’m also pitching a couple of other series to publishers via my agent. I’m putting the finishing touches to a collection of short stories for later in the year and, if I’ve got any time left after all of the above, I’m itching to write a new book (or books) in my AUTUMN series. AUTUMN is where I first made my mark as an author, and I’ve had such a great time returning to the world of my HATER books, I can’t resist the idea of going back and telling more stories from my zombie apocalypse. My writing friends, particularly my Facebook ‘fan-club’ – Moody’s Survivors. Check them out (there’s a link via my Facebook author page). A truly unique bunch of misfits! See my earlier answer. I prefer it when writing isn’t a career. No, but maybe ask me that question again in a few years time. I never release a book until I’m 100% happy with it, but as time goes by, you inevitably think of things you could have done differently/better. 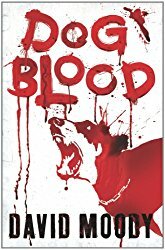 Right now I’m just relieved people are reading my most recent book (ONE OF US WILL BE DEAD BY MORNING) and that they seem to be enjoying it! When I left school I wanted to make films, but that was before the digital revolution, and my chances of succeeding were just about nil. Plus, I needed to pay the bills, eat food… things like that! I put the film-making on hold (still intend going back to it one day), but I couldn’t stop thinking about the stories I wanted to tell. I’d always had a flair for English at school so I started to write. I set myself a target of writing at least a page a day, and within 6 months I’d written my first novel, STRAIGHT TO YOU (which, going back to your last question, I completely re-wrote 20 years later). As I said previously, that would have to be John Wyndham. Though it’s a close-run thing with Richard Matheson. Both authors have that ability to write about huge, world-changing events from a personal perspective, and that always appeals. Matheson’s I AM LEGEND is an absolute classic of the genre which has influenced a vast number of writers and film-makers. Only in my head (such a pretentious answer!). Most of my books are grounded in normality, so I’m generally in a suitable location wherever I am! In terms of promotion, though, I’ve been fortunate to travel quite a lot in connection with my writing. Meeting people in countries you’ve never visited before who already know you through your books is a buzz I will never grow tired of. For me, the hardest part of writing any book is the first draft. It’s the point where all your random thoughts and ideas collide in some kind of structure for the first time. It’s where I often feel most passionate about the book, and where I hate it most. It’s like pulling teeth. It’s like giving birth to a piano (I imagine). It’s also essential. I think I learn how to write a little more from each book I finish. I also have a number of unfinished/unpublished manuscripts lying around which may or may not see the light of day someday. Looking back, I’ve learned more as a writer from the books which don’t work out than those which have been successful. Keep writing and read plenty. It’s as simple as that. Though I do have another pearl of wisdom which has always worked for me. A novel (or any story, I guess) feels like a massive undertaking when you’re sitting looking at a blank screen or an empty piece of paper. Break it down. I plan (probably more than I should) and then, once I start writing, I make myself write at least one page a day and I don’t stop and re-read or edit until each draft is finished. Thank you. And if you enjoyed one of my books, please tell a friend (or two or ten). No. But I remember the first book I read which had an impact, and I’ve already mentioned it – The Day of the Triffids by John Wyndham. Too many things to list here. If you want a really quick and trite answer – Paddington 2 did both to me. I couldn’t limit myself to one person, so I’ll pass on this question. At the risk of sounding very pretentious, I aim to learn something from every person I meet in every walk of life. Everyone’s perspective is worth considering. I told you I didn’t want to be buried (because it’s a waste of good land). I run. I find distance running is good on so many levels… it keeps my body fit and my mind active. I like to run home from the day job – by the time I get back my head’s usually clear and all the frustrations of the day have disappeared so I’m in a good place to write. I also love watching movies (who doesn’t?) and live music. I couldn’t live without music. If I was in a messed-up episode of the Twilight Zone where I had to choose between going deaf or going blind, I’d have to say goodbye to my eyes. See previous answers. I always wanted to make films. I guess, therefore, that if I wasn’t a writer I’d just be looking for different ways to tell stories. I like the idea of seeing the ending and building it back to the beginning. I start with an ending, but it’s pretty malleable until about a third of the way through the story. Perhaps I need to let it bake a little longer before I start writing. Best of luck to you.